Lots of reports of big salmon being caught in Sooke waters this week. The chinook are definitely passing through! Day to day and hour to hour it varies though, with the hot bite time or spot changing quickly. The only certainty is that you don't catch fish if you don't have a hook in the water. Early morning off Secretary Island is reported to be hot last couple of days. Also reports of coho salmon in local waters ... that action should increase over the next few weeks. 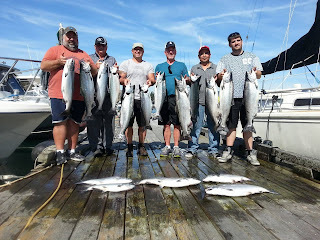 Here's Blue Wolf Fishing Charters with a pretty epic day of fishing this weekend!